Knockaloe prison-camp, situated on farmland in the west of the Isle of Man, incarcerated over 20,000 civilians during the First World War. The socio-economic background of these civilians was diverse, but they all had two common identities: they were all men of military age (between 17 and 55); and they were all nationals of Britain’s wartime enemies, Germany, Austro-Hungary, and the Ottoman Empire. Britain’s internment policy mirrored the policies adopted in Germany and France, while other belligerents passed legislation to monitor and restrict the liberty of so-called ‘enemy aliens’. Forcibly displacing and interning civilians was not an invention of the First World War, but as Matthew Stibbe argues, the war saw a ‘much broader, technologically more sophisticated’ use of the policy compared to earlier examples (Stibbe 2008: p.54). In the context of the millions killed during the war, the detention of ‘enemy aliens’ in Britain may appear a minor tragedy by comparison. Nonetheless, the humanitarian response to camps like Knockaloe provides a significant insight into a transnational relief operation involving a range of humanitarian actors. Additionally, Knockaloe draws attention to common problems and tensions which can affect efforts to create ‘humanitarian space’ in civilian internment. While the precise reasons belligerents resort to internment camps vary between contexts, internment is often a state’s response in times of war to ‘categories of civilians who… cannot be integrated into the political system’ (Agamben: p.2). Similar to concentration policies in colonial contexts like the Spanish-Cuban War (1895-1898), or the South African War (1899-1902), Knockaloe demonstrates that as the intensity of conflicts escalate, the boundaries between combatant and non-combatant, between ‘innocent’ civilians and ‘the enemy’, often blur. In this ‘state of exception’, the British government and public regarded internment as justified due to the threat ‘enemy aliens’ represented as potential spies as well as the ‘barbarous’ nature of German warfare. While internment camps are designed to contain and control civilians, and not exterminate them like those used in German South-West Africa against the Herrero (1904-1908) or the Nazi’s later camp system, the Cuban and South African examples demonstrate how widespread abuses against civilian detainees can become ignored, normalised, or even justified by military or moral arguments (Smith and Andreas: p.431). The challenge for humanitarian actors at Knockaloe was preventing further cycles of violence against civilians who had already been detained. However, their desire to access the camps existed in a fundamental tension with the authorities’ aim of isolating these civilians from the outside world. Foremost in attempting to aid civilians in Knockaloe were the Friends’ Emergency Committee for the Assistance of Germans, Austrians, and Hungarians in Distress (FEC), a charity established by a group of left-wing, pacifist Quakers and one of the few exceptions to the widespread hatred Britons showed towards ‘enemy aliens’. In addition to providing monetary grants to the families of internees, the FEC established a network of inspectors to visit and report on camps, and attend to the personal matters of individual internees. Moreover, they sought to encourage transnational links and work with German humanitarians. For example, they collaborated with the German Red Cross’ representative in Britain, Dr Karl E. Markel (1860-1932), in providing educational and social activities for Knockaloe. They also corresponded with their ‘counterpart’ committee in Berlin, run by Elisabeth Rotten (1882-1964), to share information on prisoners held in Britain and Germany respectively. Finally, their major activity in Knockaloe was helping to organise industrial workshops which provided employment for internees. Such work-activities aimed to alleviate the inmates’ boredom and improve their morale, in response to concerns over the psychological effects of long-term imprisonment, a condition the Swiss doctor Adolf Lukas Vischer (1884-1974) termed ‘barbed-wire disease’. However, by improving the morale of civilians, and distracting them from the condition of their imprisonment, the FEC effectively assisted the authorities ultimately responsible for imprisoning these civilians. The Home Office noted how the FEC’s work schemes ‘greatly lessened the difficulty of carrying on the administration of the Camps’ by reducing the chance of prisoners rioting (UK National Archives, HO/45/10887/350150). This is illustrative of a wider tension regarding internment: humanitarians must walk a fine line between providing resources or activities which can improve civilians’ experience of imprisonment, and providing the authorities, who are the cause of the humanitarian problem, with the materials or legitimacy to continue to incarcerate these civilians. Civilian internment at Knockaloe posed other problems to the transnational humanitarian actors responsible for protecting prisoners on both sides of the war. Delegates from the International Committee of the Red Cross (ICRC), which was just beginning to concern itself with civilian protection, and neutral nations like the USA (before 1917), Switzerland, and Sweden all inspected Knockaloe throughout the war. Theoretically, their visits established an impartial assessment of conditions in camps, relayed this information back to prisoners’ families and governments, and held abuses against prisoners to account. However, in practice, critical reports risked offending the authorities controlling access to the camps, thus jeopardising future inspections. Additionally, as Stibbe and Heather Jones have argued, the fact both sides held thousands of prisoners meant critical reports against one belligerent could encourage their enemies to enact retaliatory reprisals against the prisoners they held. Both these factors severely undermined the independence of neutral actors like the ICRC, meaning one should read their reports of camps like Knockaloe with caution. Indeed, many of the Knockaloe reports were broadly positive of the conditions, particularly once authorities had addressed some of the problems these delegates had earlier identified. However, although there were only a small number of civilian deaths in the camp, this should not detract from the mental anguish which internees suffered from the loss of liberty and separation from their livelihood and families. Following the war, many civilians, so embittered by their wartime experience, chose to return to Germany, while many others were forcibly deported. 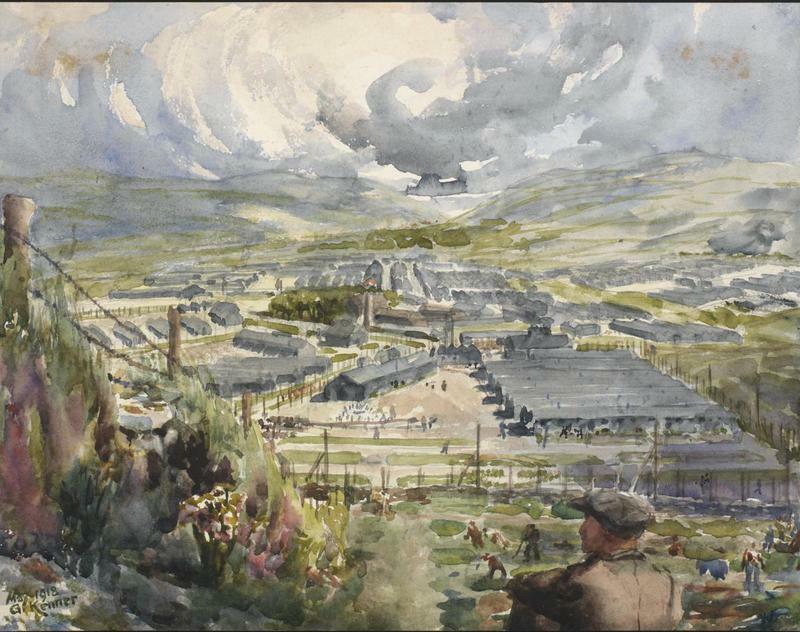 Moreover, although the principle of ‘reciprocity’ meant larger camps like Knockaloe, or Ruhleben in Germany, were generally ‘satisfactory’, civilians held captive outside these camps, in forced-labour battalions for instance, received less humanitarian attention and consequently suffered more systematic abuses. Civilian detention has cast a long-shadow over the twentieth century. However, between different cases, the purpose and conditions of internment have varied enormously, which can fundamentally affect how far different authorities are willing to allow humanitarians to access camps. While the Knockaloe authorities recognised the value of aid work to their administration of internment, in cases where systematic abuses are prevalent, governments may not want outsiders learning the true conditions. Moreover, while humanitarians may categorise prisoners as ‘civilians’, later conflicts like colonial wars in Kenya and Algeria or today’s ‘War on Terror’ demonstrate how boundaries blur between ‘civilians’, ‘soldiers’, ‘insurgents’ and ‘terrorists’. Depending on what a prisoner is labelled can affect their legal and political rights. For humanitarians, paying attention to these differences is critical for determining their best strategy. Confidentiality, for example, may be an appropriate strategy in internment camps like Knockaloe if it guarantees long-term access to detainees. In extermination camps, purposely designed to destroy, not simply detain, civilian populations, confidentiality does little to protect civilians, as the ICRC’s failure to speak out against the Nazi concentration camp system shows. Braithwaite-Thomas, Anna. St. Stephen’s House: Friends’ Emergency Work in England, 1914 to 1920 (London: Emergency Committee for the Assistance of Germans, Austrians, and Hungarians in Distress, 1933). Jones, Heather. ‘International or transnational? Humanitarian action during the First World War’. European Review of History-Revue européenne d’histoire 16, no.5 (2009): pp.697-713. Stibbe, Matthew. ‘The Internment of Civilians by Belligerent States during the First World War and the Response of the International Committee of the Red Cross’. Journal of Contemporary History 41, no.1 (2006): pp.5-19. Stibbe, Matthew. ‘Civilian Internment and Civilian Internees in Europe, 1914–20’. Immigrants & Minorities 26, no.1-2 (2008): pp.49-81. Agamben, Giorgio. State of Exception (Chicago: University of Chicago Press, 2005). Klose, Fabian. ‘The Colonial Testing Ground: The International Committee of the Red Cross and the Violent End of Empire’. Humanity 2, no.1 (2011): pp.107-126. Kotek, Joël and Rigoulot, Pierre. Das Jahrhundert der Lager: Gefangenschaft, Zwangsarbeit, Vernichtung (Berlin: Propyläen, 2001). Smith, Iain R. and Stucki, Andreas. ‘The Colonial Development of Concentration Camps 1868-1902’. Journal of Imperial and Commonwealth History 39, no.3 (2011): pp.417-437. Ben Holmes is a postgraduate researcher in History, co-supervised by the Universities of Exeter and Bristol. His current project, funded by the AHRC, studies British charitable relief to German civilians during and after the First World War in order to examine the difficulties of providing humanitarian aid to civilians who are categorised as ‘the enemy’. Ben was a participant of the Global Humanitarianism Research Academy 2016. Citation: Ben Holmes. ‘Knockaloe, 1914-1918: Civilian Internment in Wartime’, in Online Atlas on the History of Humanitarianism and Human Rights, edited by Fabian Klose, Marc Palen, Johannes Paulmann, and Andrew Thompson, 2017-06, urn:nbn:de:0159-2017071042 [2019-04-26].